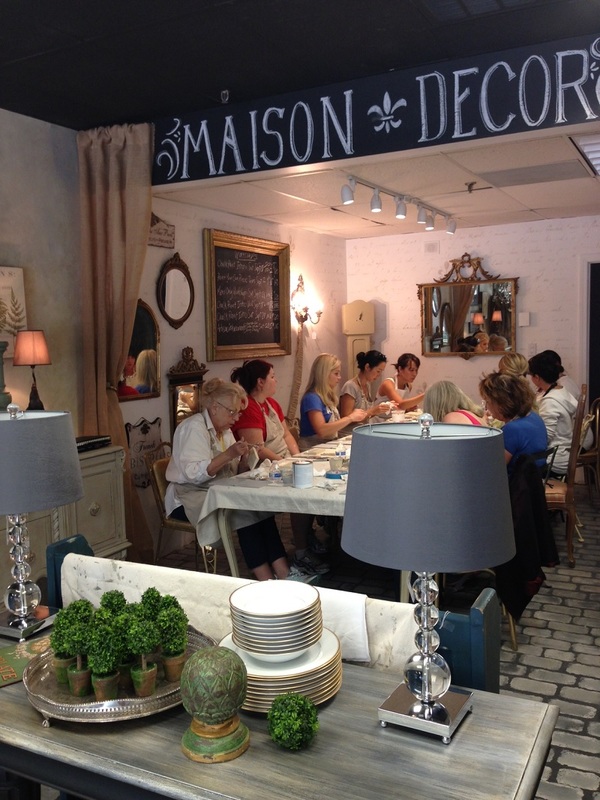 Recently, I had the good fortune to observe an Annie Sloan Chalk Paint class instructed by Amy Chalmers, owner of Maison Decor in Reading, Mass. 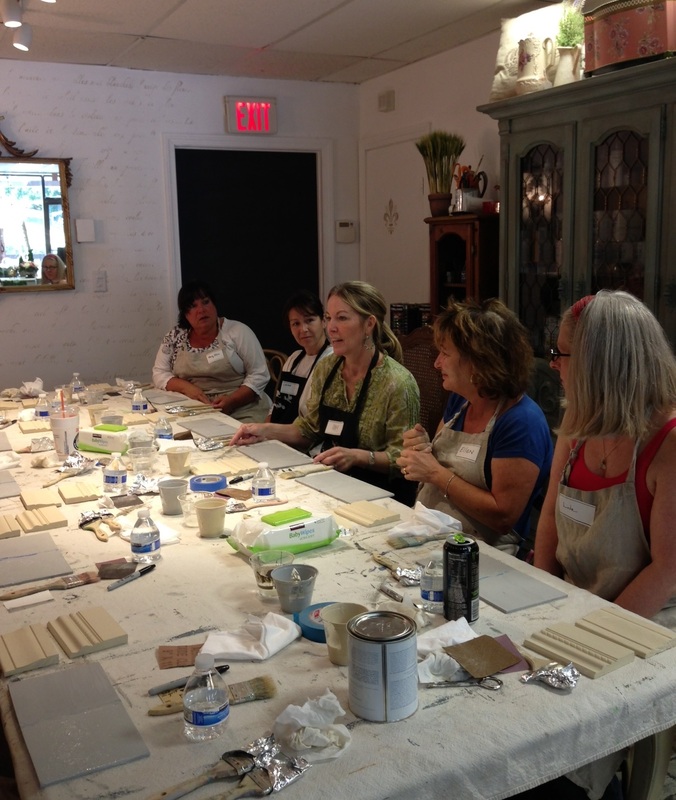 With the perfect blend of skill, patience and great humor, Amy was able to successfully educate the attendees of the class on the basic techniques of using chalk paint to make their life more beautiful. 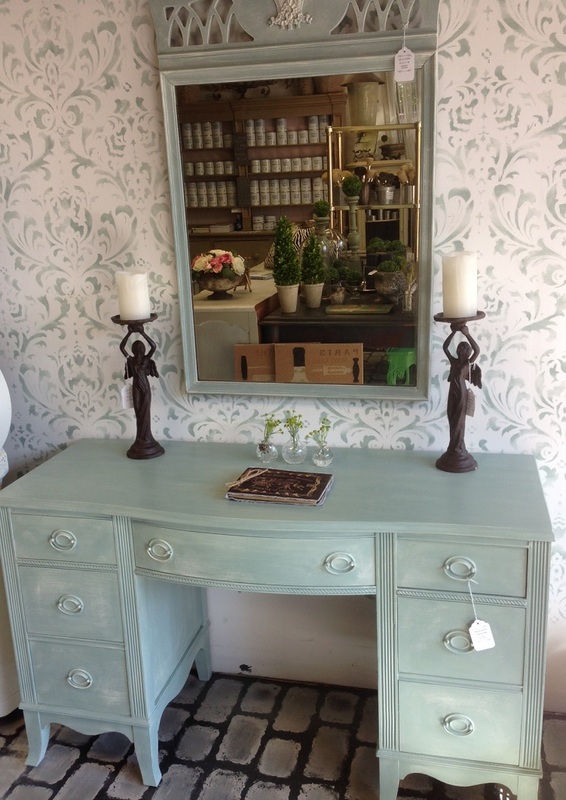 Fast forward to the present, where Amy spends the bulk of her time in the Reading Shop as an Annie Sloan “stockist” and teacher, offering painting workshops while creating and selling gorgeous pieces of furniture and decor, all finished with Annie Sloan Chalk Paint. 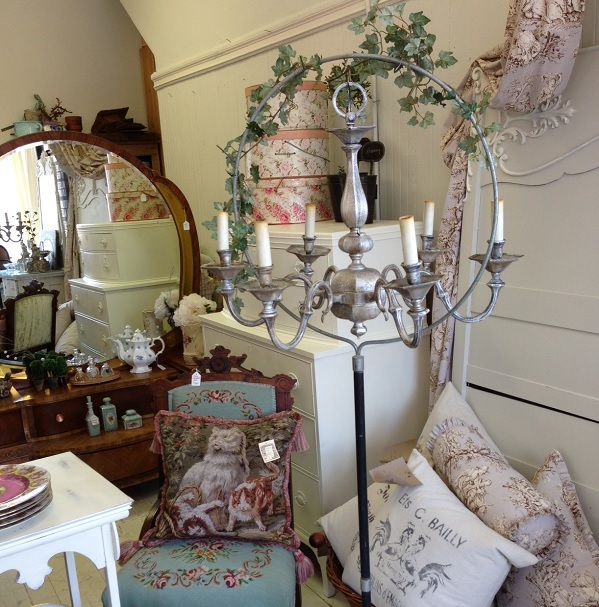 Entering into the store from Main Street, you feel as if you are stepping into an old chateau in the French countryside. 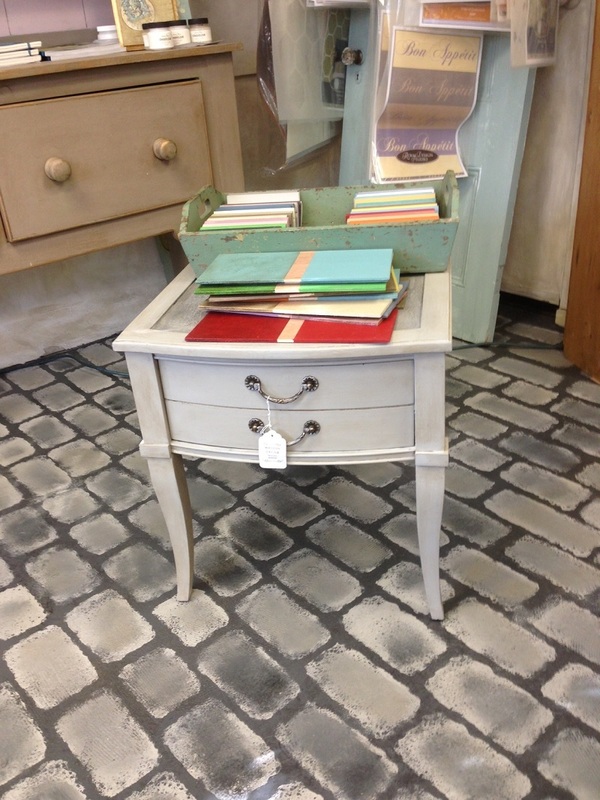 and vintage pieces, all restyled and refinished using Annie Sloan paints and finishes. She and her sons, Justin and Colin, also working in the business, created this cobblestone floor using sponges and chalk paint. Magnifique! FYI-the guys teach a “men’s-only” class, for the gents who would like to learn the painting techniques while not surrounded by women. Or maybe not. 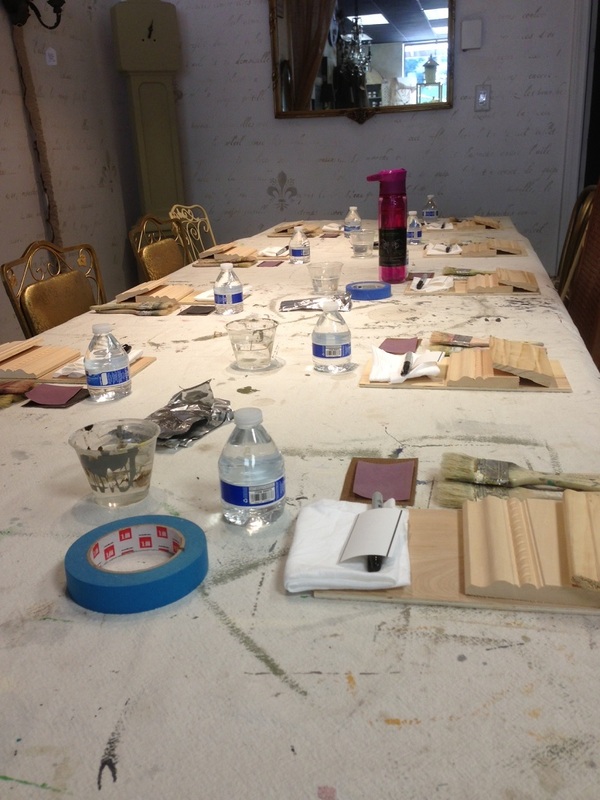 I arrived a bit early on workshop day, checking out the work table at the back of the shop, all set with the necessary tools and aprons her participants would need. Once the class got rolling, Amy was a great teacher, at first educating her students on the paints, the company and furniture styles, but then it was time to get messy! Amy’s charming teaching style is stand-up comedy meets mad scientist meets art professor. She knows her stuff, and is eager to impart her vast knowledge and expertise to her students, demonstrating technique and patiently answering any questions from her class. 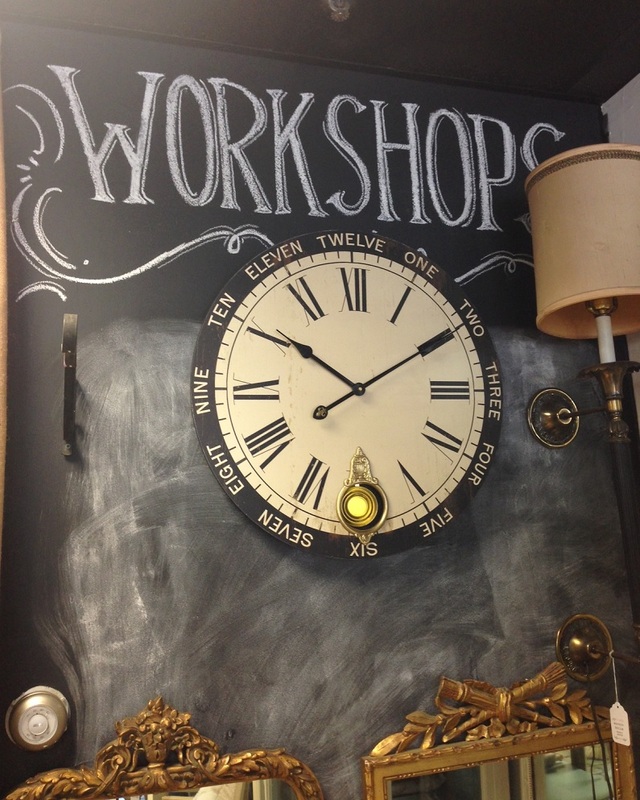 This is a hands-on workshop- no boring lectures here! 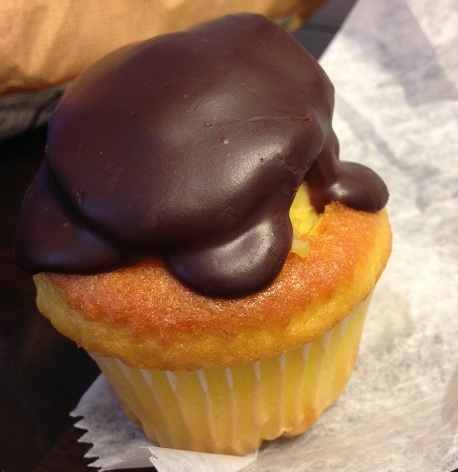 and here are some samples from one of the class members: pretty close, agreed? A Whale of a Weekend! 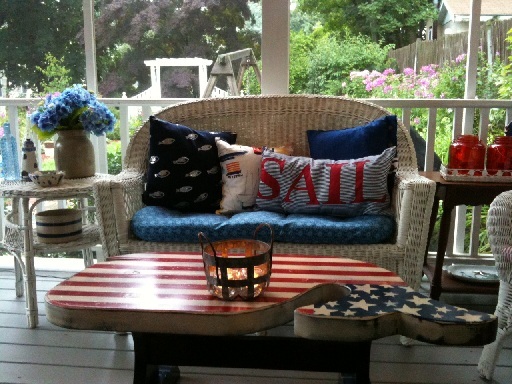 Over the 4th of July weekend, I traveled to Cape Cod to spend the holiday with a good friend at her family’s beach-side cottage in Falmouth. 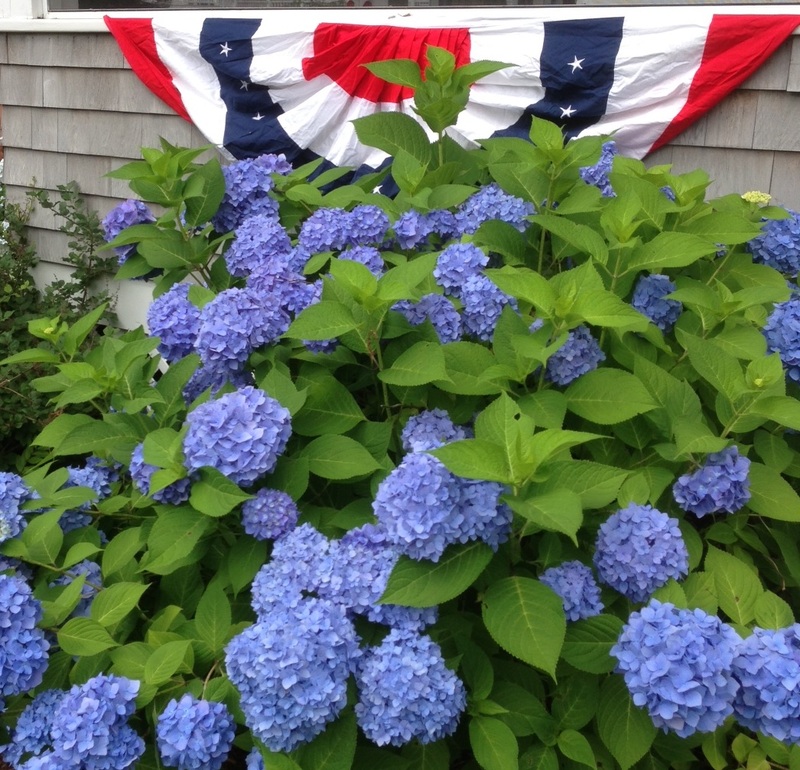 Is there anything more quintessentially Cape Cod than magnificent blooming hydrangeas against grey cedar shingles? Beautiful!! 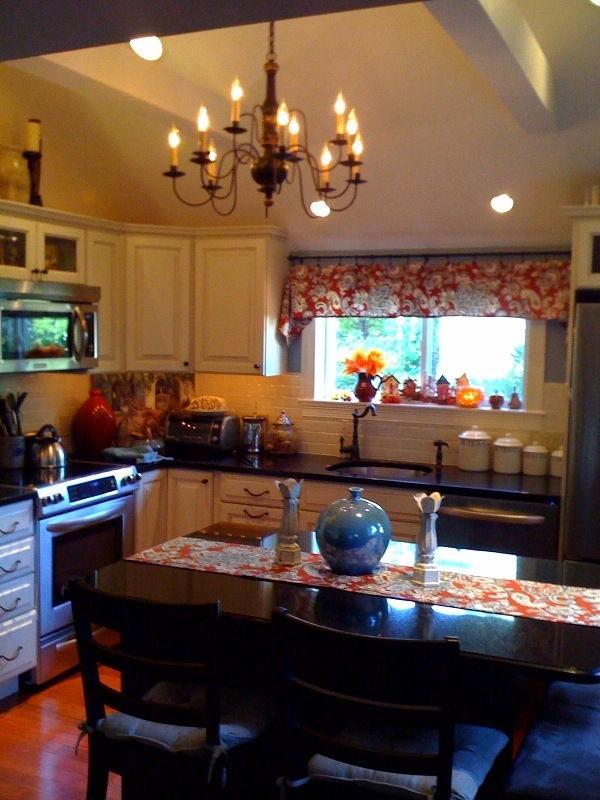 a vintage kitchy kitchen and many of the original furnishings still in place. 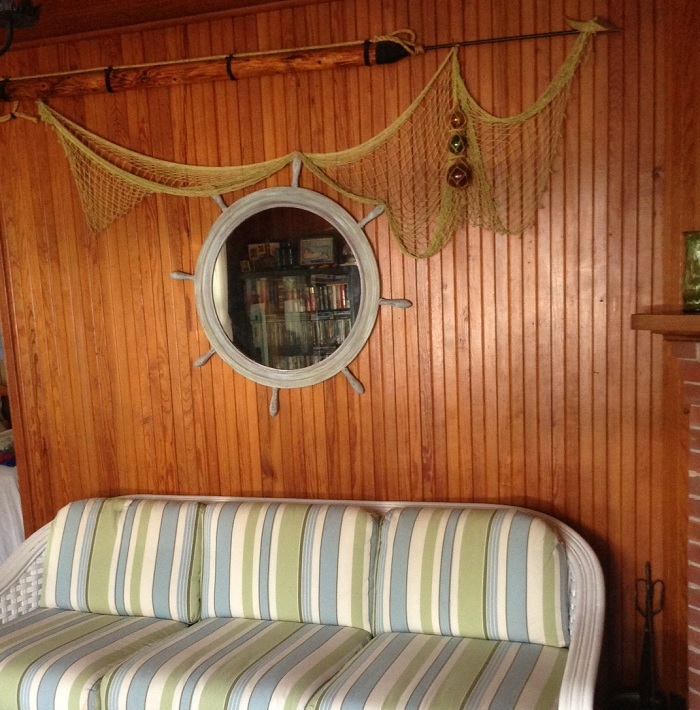 Since she is slowly attempting to freshen and lighten the decor, her most recent flea market find was a white rattan living room set with green and blue striped cushions-so comfy and pretty! that most closely matched the stripes in the cushion fabric. for its awesome priming ability to stick to pretty much anything. 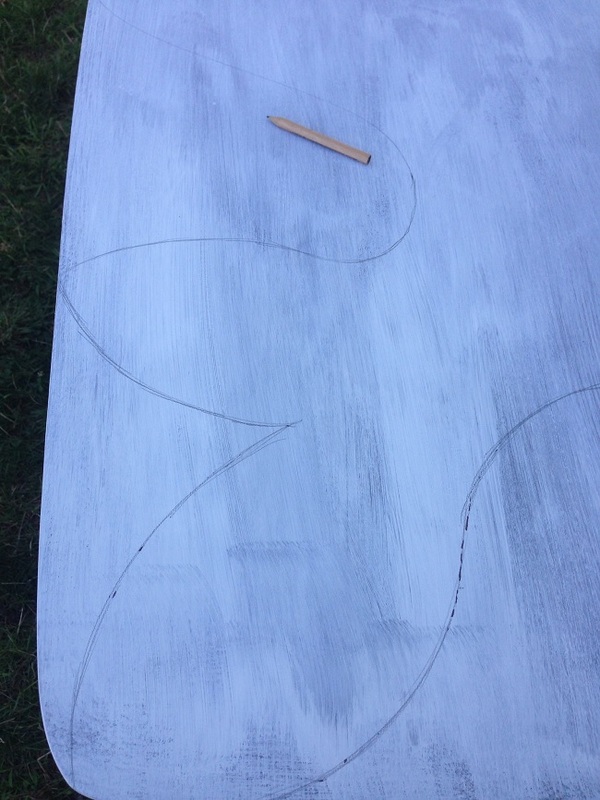 and then draw a whale on the primed table top surface. It you don’t have any drawing skills, the next best thing is to find the shape online and then print it. My skills are primitive, at best, but they get the job done. Whales are pretty simple though. They are kind of just a big old long blob with a mouth and a tail. 3. Paint the background color. 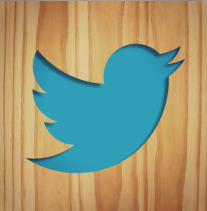 In this case, we used the darker green to give it a good definition. That also wrapped around the edge of the table. 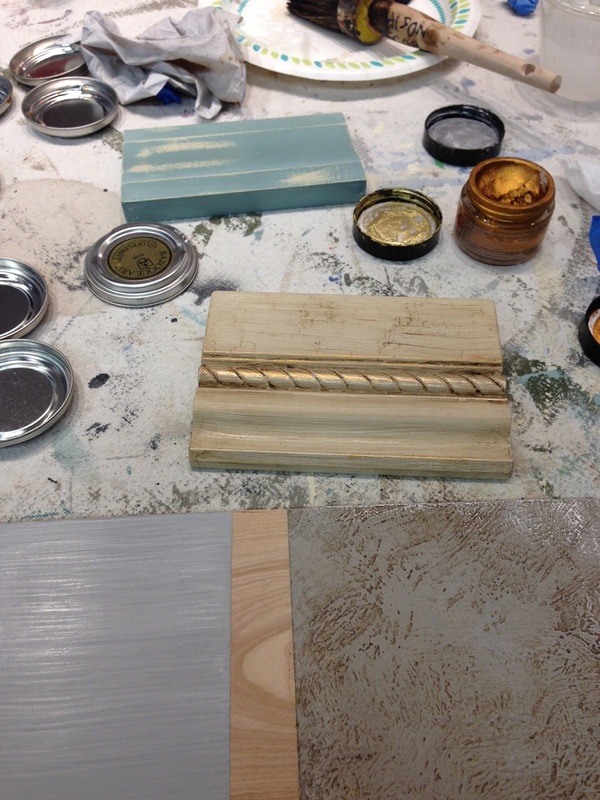 Then we painted the skirt and the legs the other contrasting colors of Mother Nature, Grape Vine and Blue Fox. 4. Painted the background color of the whale. In this case, it was a Behr plain white. Now you can really see the shape taking shape against the darker green background. 5. Tape off the stripes. I originally measured true center, then started a line across using the table edge as a guide. However, I soon realized that since the table is oblong, it gracefully slopes down as it nears the edges. 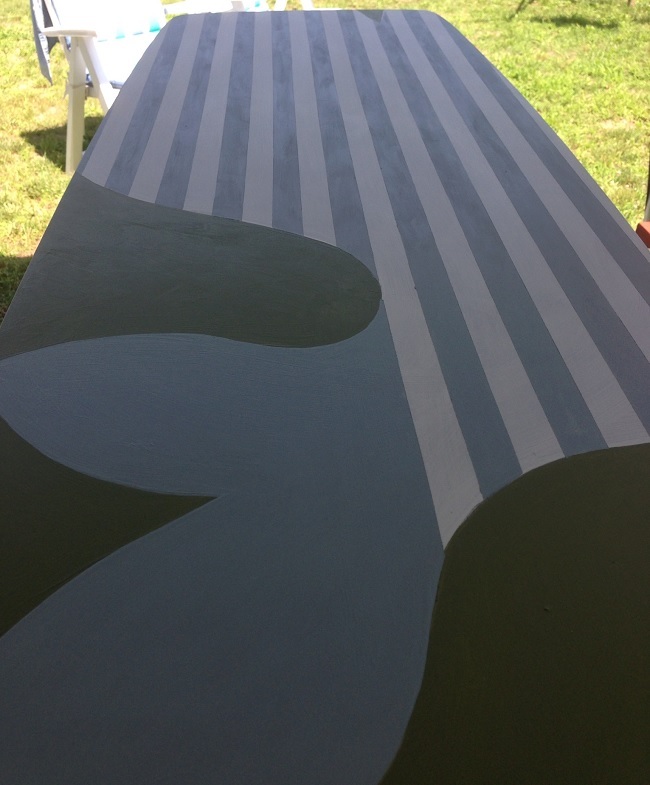 We could have followed those lines and created a curved effect, but we were going with pin-striped preppy whale so we just started with the center lines, then pulled the tape taut across. A quick tip: instead of measuring each individual stripe row spacing, we just placed a small piece of tape, then started the next row-quick and easy! 6. Painted the blue lines and tail. Make sure that when you are painting along the tape, you use light coats and strokes so it doesn’t bleed underneath the tape lines! Two light coats are better than one heavy coat. This paint takes so little time to dry, especially in the hot Cape Cod sunshine, that it was only a matter of minutes between coats. 7. Pull the tape and step back and admire the cute preppy whale emerging. 8. Decorate the tail. We wanted to make him look a little more fresh and beachy, so we used a starfish shape cut from an old sponge. 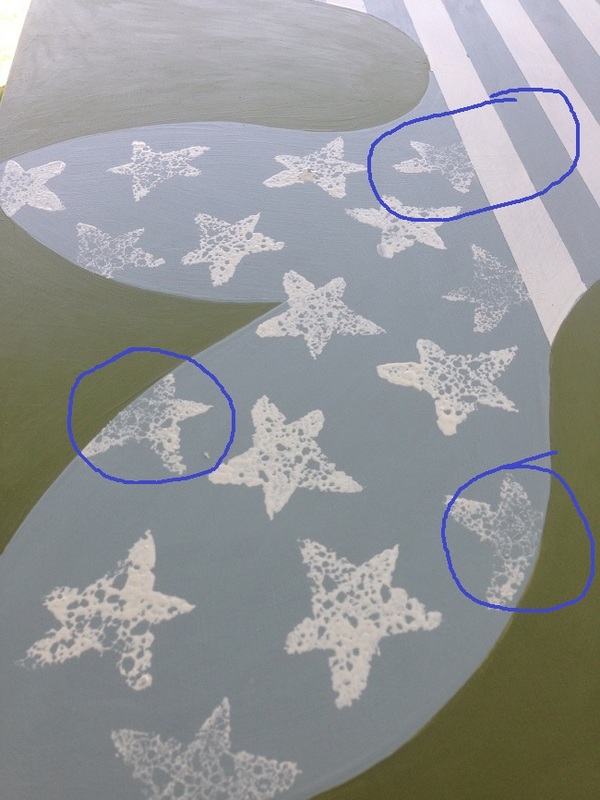 With the white paint, we began sponging the stars on his tail in a random pleasing pattern. This is your chance to use your creativity! Don’t want stars? 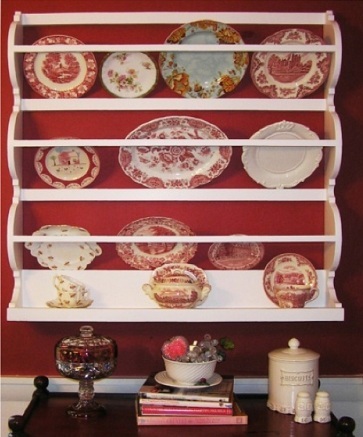 Use circles or spirals! Anything you can think of you can cut out of a sponge or potato or find a stencil or stamp at your local craft store. 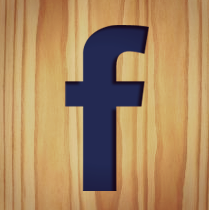 Tip: try to stamp a couple along the edges with a partial pattern so the overall effect is more even and not cramped into the defined space. The sponge effect is lighter and makes for more realistic starfish. 9. Add an eye. This is a personal choice, but since whales have eyes and we wanted to add a touch of the soft green to the top, this half-moon shape worked beautifully. 10. Stand back and admire. The table is back in place in front of the new sofa, and it instantly added a bright, whimsical touch to the living room. At that point, it was time for me to head back home (to avoid the notorious Cape bridge traffic). 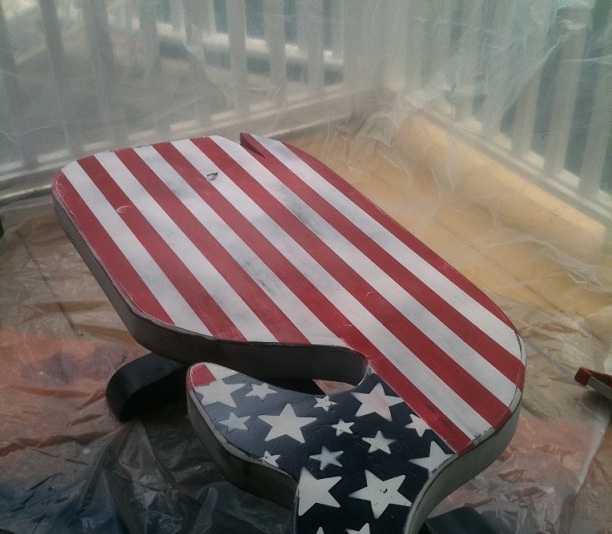 So she’ll be finishing her whale with a touch of glazing and a couple of coats of polyurethane. 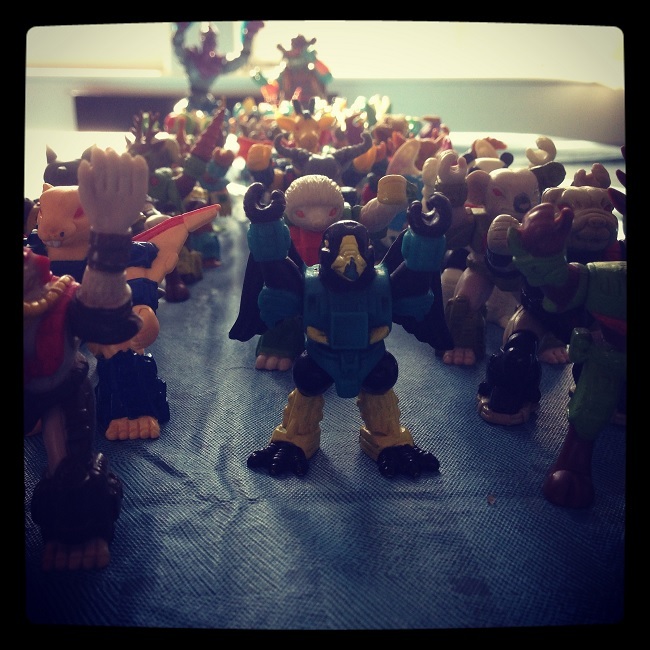 Need to protect our project from the battle beasts that were once played with by her sons, and now by her grandsons. 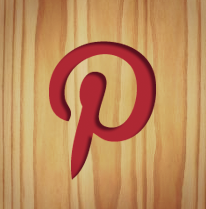 PS: Check out my links on the Thirty HandMade Days Pity Party and on My Repurposed Life! 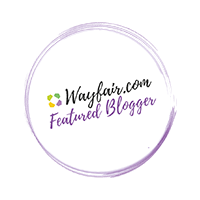 Those of you who follow my blog know that I love to discover amazing local shops and then share that information with all of you. 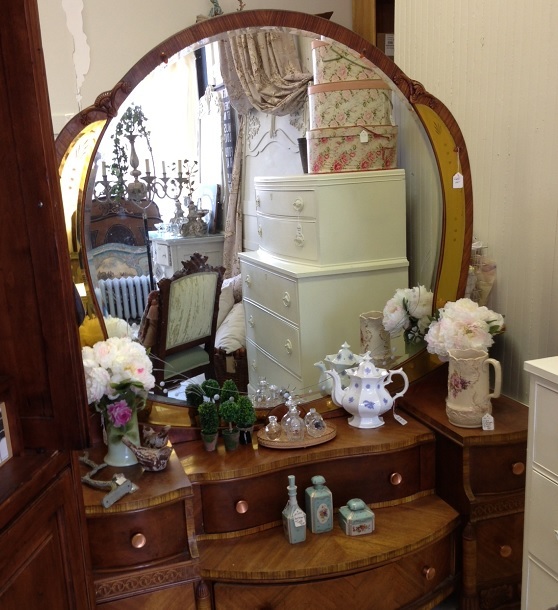 Yesterday I ventured to Malden, Ma (just a short “T” ride from Boston) to visit Maison Décor. 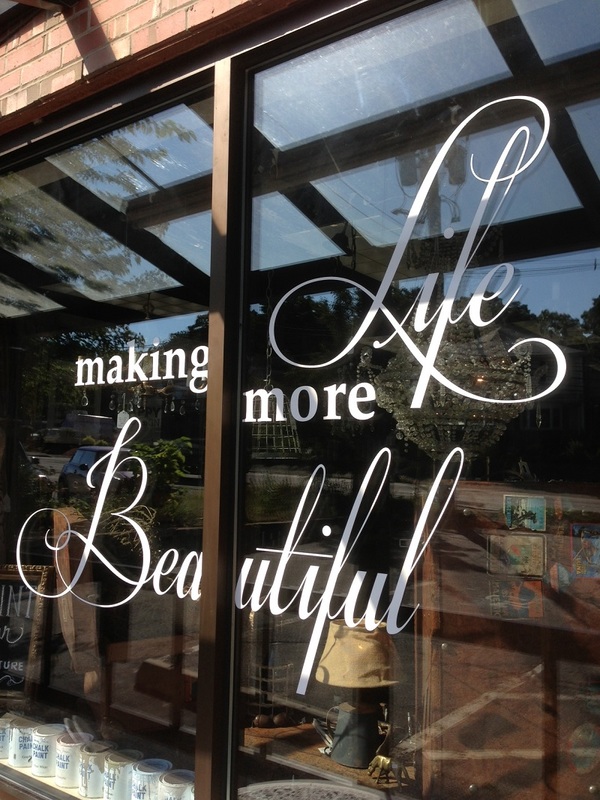 I had read about this charming shop, owned by Amy Chalmers, from Steven Fuller’s blog, An Urban Cottage, so I decided to take a ride over to check it out. The lovely, welcoming exterior was a colorful contrast to the otherwise dreary gray palette we are calling spring this year in Boston. 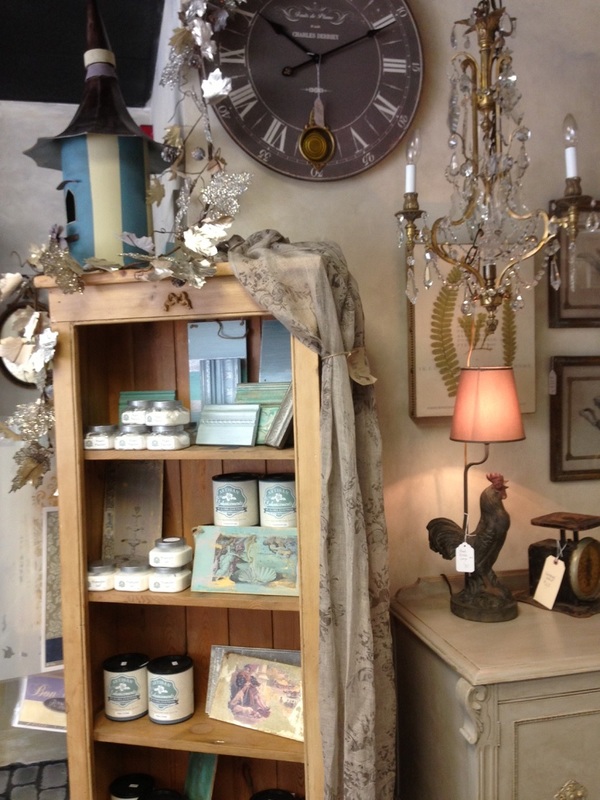 Inside, the shop has several vignettes showcasing Amy’s work as an artisan-her style defines the essence of French Country. 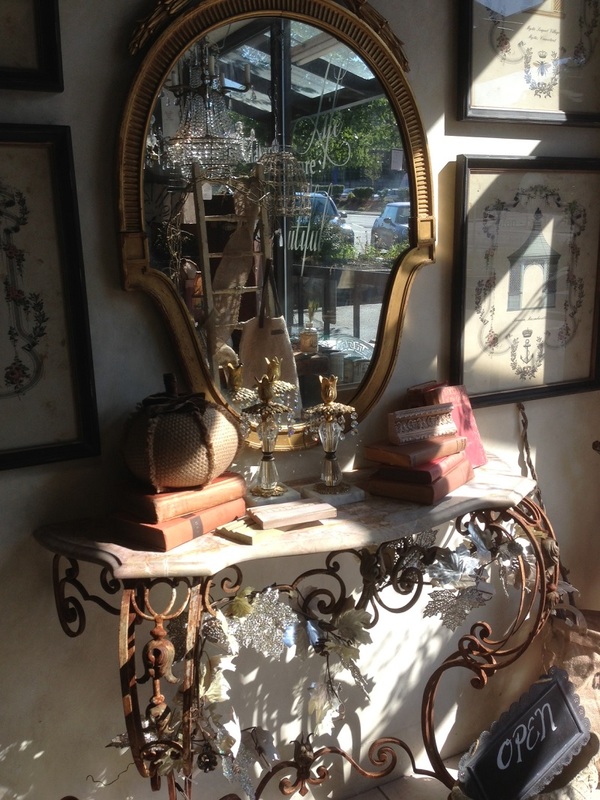 plus secretaries and armoires that have been painstakingly transformed into showpieces, the shop is eye candy for anyone searching for that softly muted, elegant French Country Style. 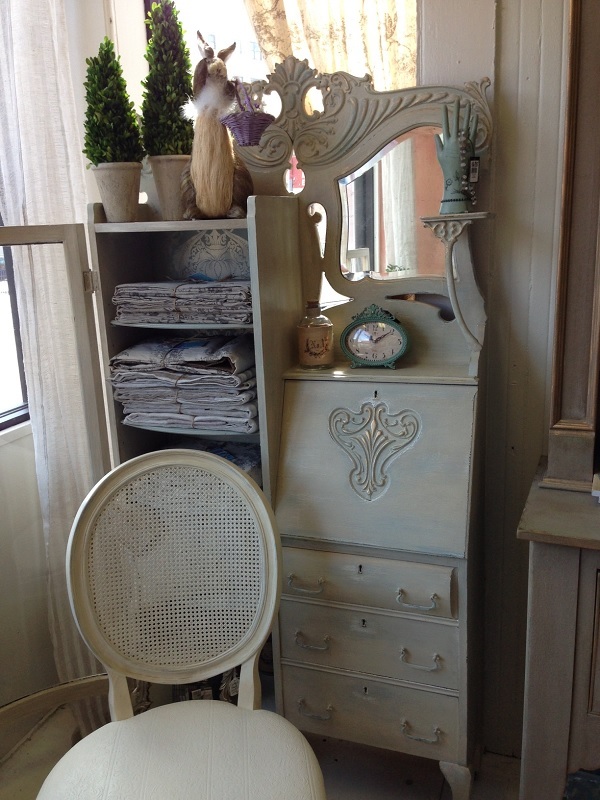 Using Annie Sloan chalk paints and waxes, Amy re-imagines and re-cycles old, dark pieces into fresh, fanciful furniture. 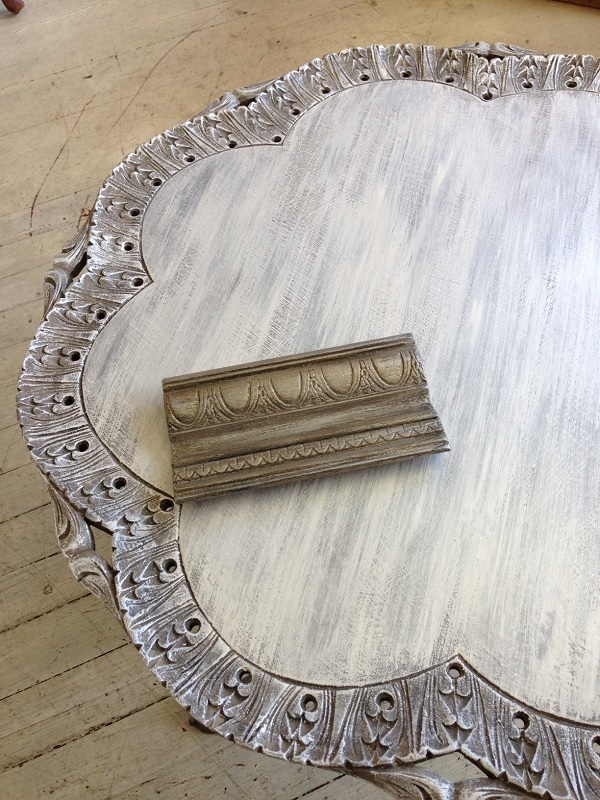 She shared with me the techniques used to transform this lace cut side table- multiple layers of paints, glazes and waxes will be used to achieve the desired (gorgeous!) effect. Painstakingly time-consuming, but well worth the time spent when you see the finished products. 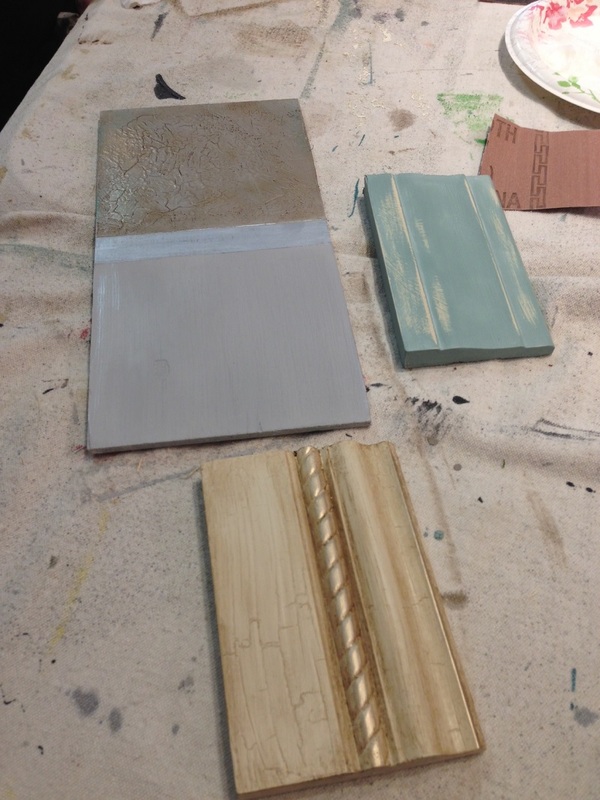 Also now offered in her shop, a new line of finishing products called Artisan Enhancements, a line of “innovative, decorative mediums” that can add another dimension to your painted furniture. This massive armoire, formerly boasting a peach poly finish is being reworked into a “vintage” piece worthy of any chateau, using both Annie Sloan paints and the finishes from Artisan Enhancements! You can read all about the transformation process on her blog Maison Décor- Using Transfer Gel, where she shares “how-to” tips. 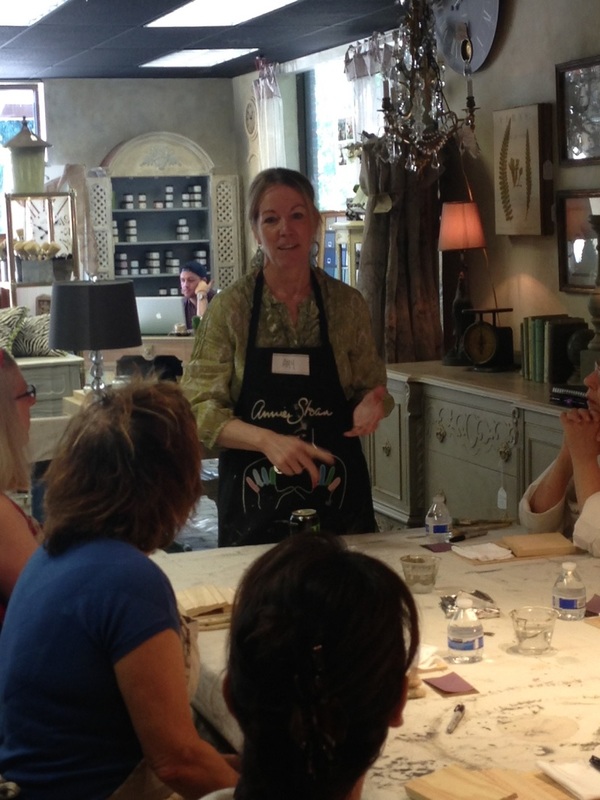 For those of you just a bit wary of attempting chalk painting and gel transferring techniques on your own, Amy offers Sunday Workshops right in the midst of her showroom where inspiration surrounds you. 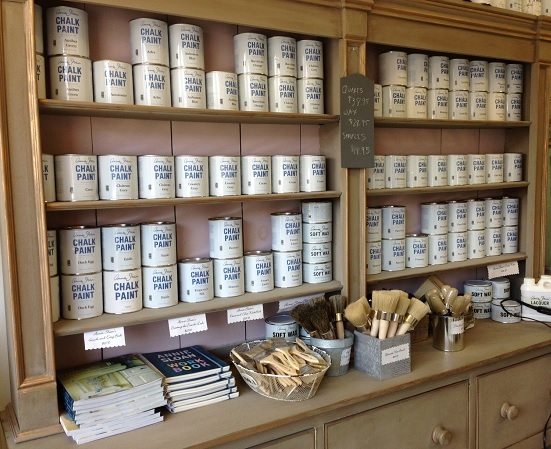 And for those of you searching for Annie Sloan Chalk Paint supplies, you have come to the right place! 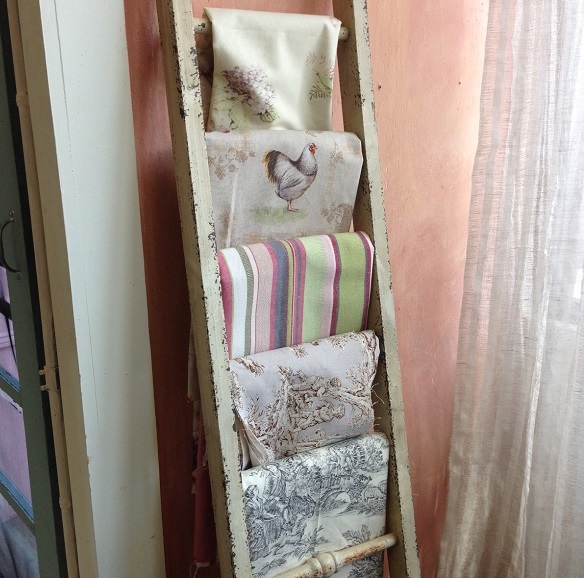 An authorized distributor, she stocks cupboards filled with paint pots, brushes and books that line the walls along with stacks and racks of lovely fabrics and sheer drapery panels that are available as well. 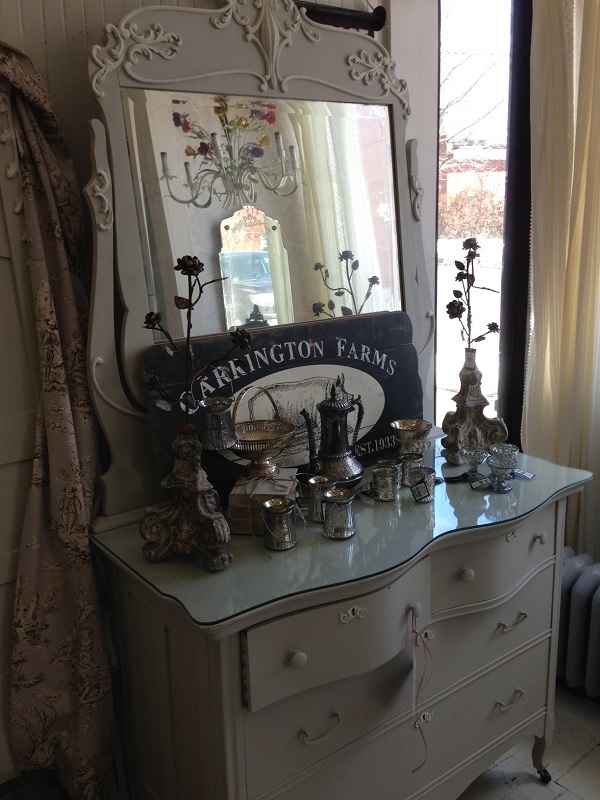 While she does sell the furniture and accessories online through her Maison Décor Shop, the paints and waxes are only sold in her shops, both at the 50 Summer Street location in Malden and at the shop on Harrison Ave in Boston’s South End. 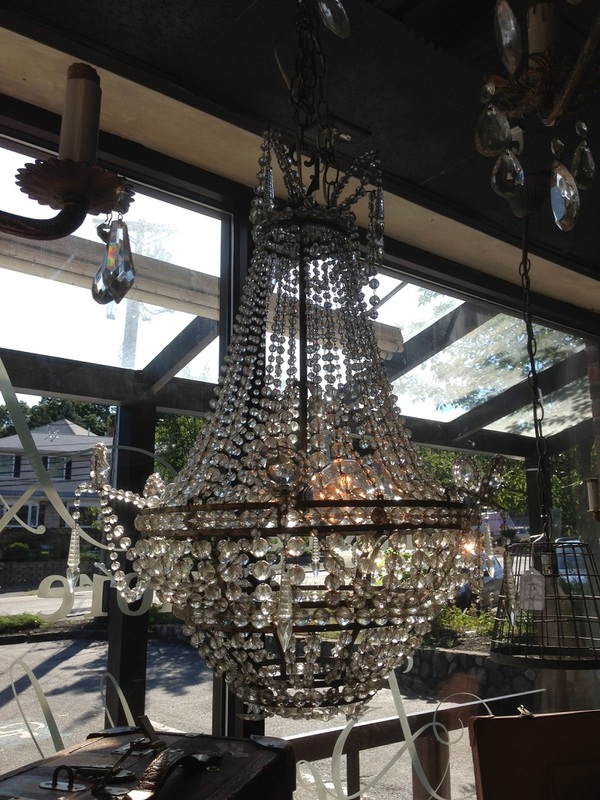 Which would be a great reason to stop in for a visit…just tell her that Susan from Country Design Home sent you! it was a little yellowed, scuffed and dinged, but I knew it was the perfect shape and size for my family room. The cost? It was a free “throw-in” because Coach was buying a “new” set of golf clubs, since the set he previously owned could have been used in the filming of “The Greatest Game Ever Played”. Here is how I did it. Coach lightly sanded the whole thing, I added the dark blue paint coat to the base- this is the color you want to see when the crackling does its magic. I wanted the top to remain a natural wood finish so I left that alone. This is the crackling medium from Plaid Enterprises. You can get it very cheaply at any local craft store. A little goes a very long way. This is a liquid you apply wherever you want the topcoat to “crackle” to show the undercoat paint color. I applied it sparingly, to give the piece a more natural cracked finish. Paint the surface with crackling medium. Allow to dry. Paint over that with your top color. Be careful to only brush in one direction. Do not go back over where you previously brushed as it will smear the crackled look! Alow to dry. I added a coat of water-based matte polyurethane prior to brushing on the antiquing glaze, since I didn’t want the finish to be too dark. The poly blocks the glazing from being absorbed too deeply into the painted surfaces. 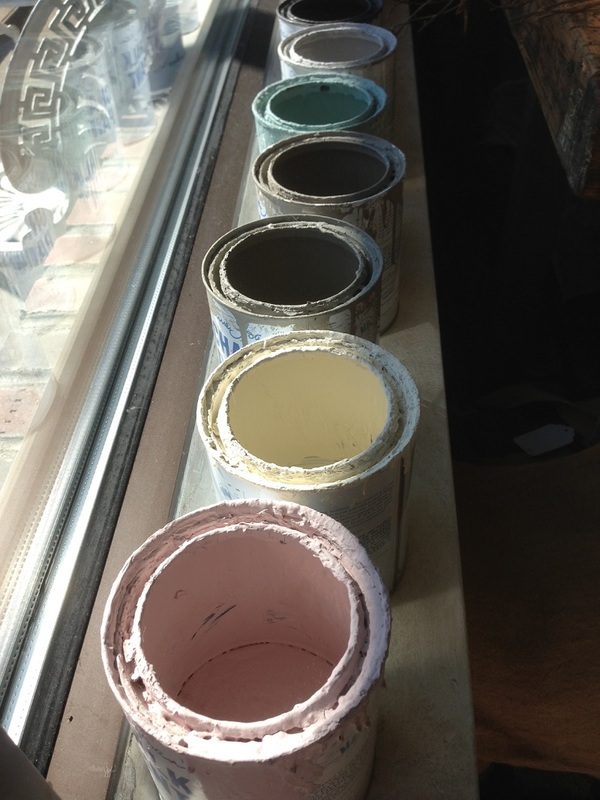 This is the glaze I use, but you can also use any clear glaze with your color mixed in for a custom look. At this point, I glazed the top as well, since I wanted it to be a bit deeper and richer color than the original unvarnished look. Allow to dry. Final step. 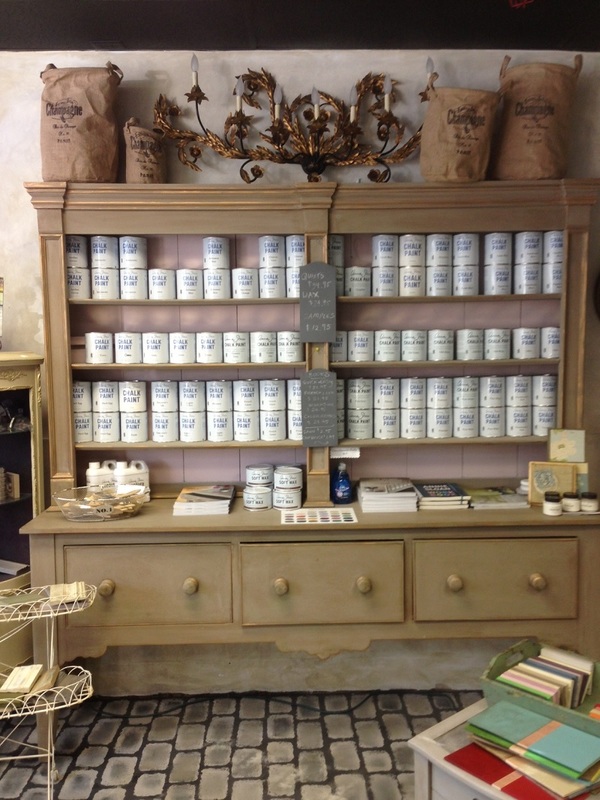 Annie Sloan soft paste wax. Available in light and dark finishes. I probably could have skipped the glazing part if I had used the dark. allow to dry, then buff it off. What a finish! Glowing and warm. Kind of like a freshly polished and buffed pair of old leather shoes. So country pretty. 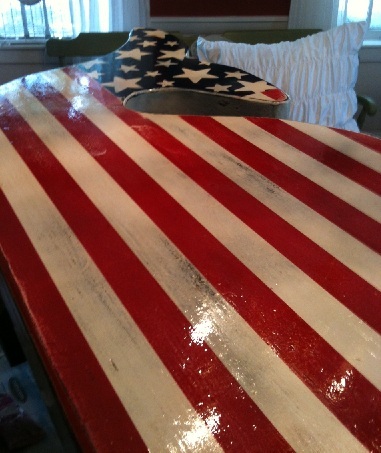 Family room table project complete. Total cost? 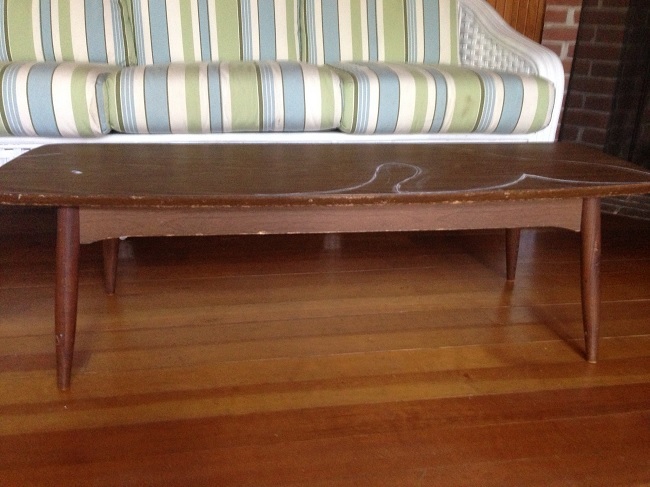 Coffee table: free! Glazing: was $10 but it was from the Whale Table Project, and I only used a tiny amount, so lets say $1.00. Wax: $28.00, but only used 1/4 of the can, so $7.00 for that. Paints, brushes and water based poly are all stuff I had on hand from many previous projects, so we will say $2 tops for all. Total cost? $10.00! Weekends around here are typically saved for yard work, house cleaning, reno projects and getting together with family and friends. 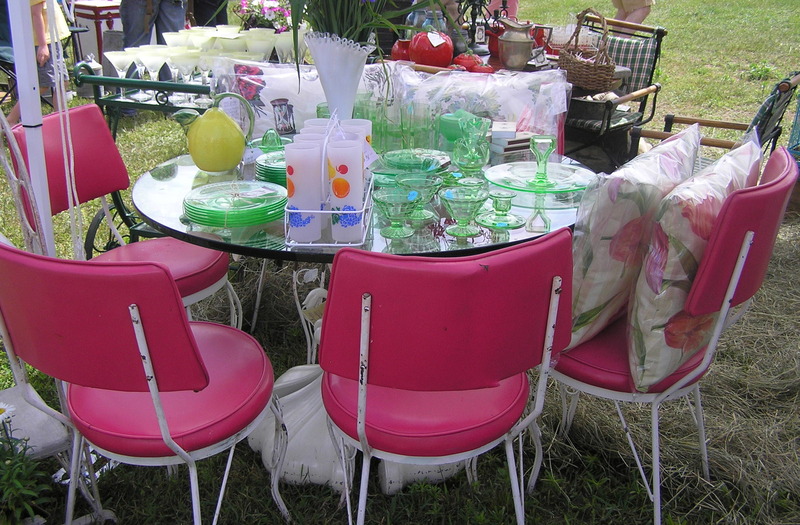 Weekends are also earmarked for yard and estate sale-ing, trash to treasure hunting and attending an occasional country fair or arts festival. 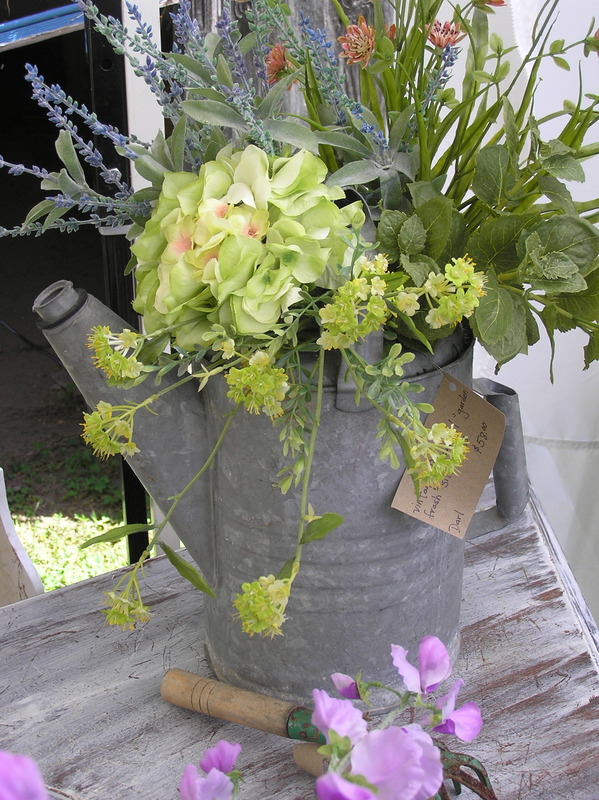 This past Saturday and Sunday, The Vintage Bazaar hosted ‘The Summer Bazaar and Music Festival” at Pettengill Farm in Salisbury, MA. Featuring local live musicians, food and over 125 vendors from 11 states, this fair was billed as “an inspiring experience for all the senses”, and it delivered on all points. 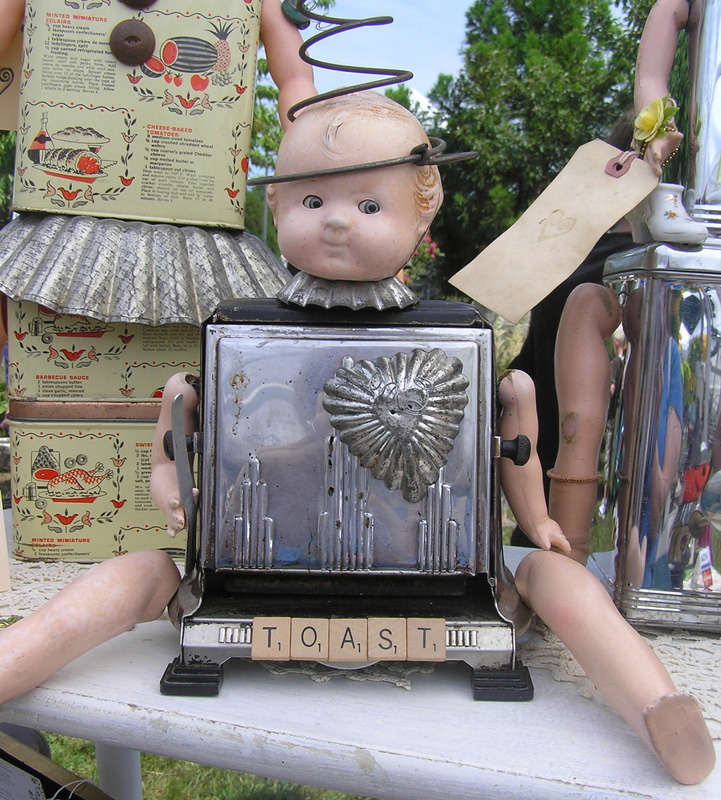 Although we did not partake of the amazing variety of foods, the music was folksy and fun, but the star of the show was the variety of vintage vendors. 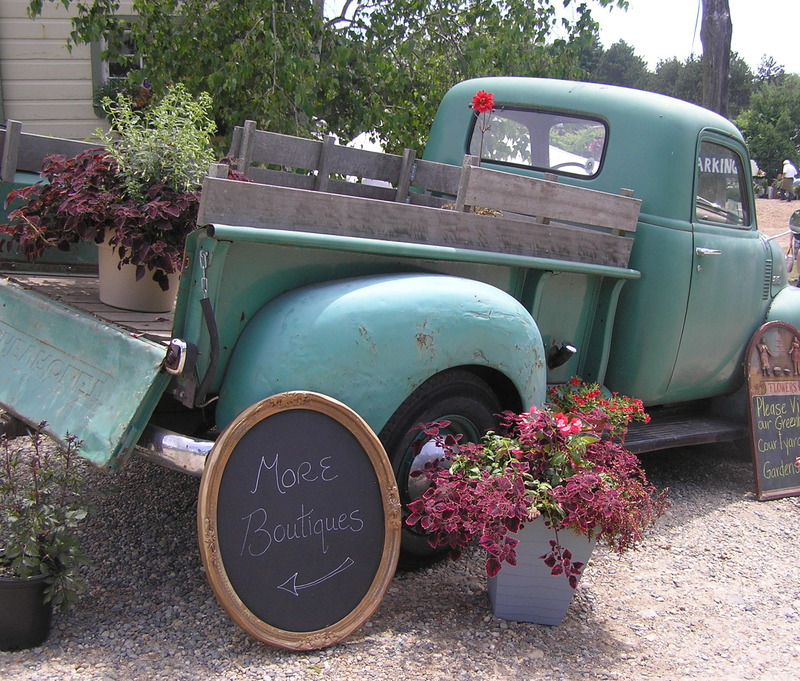 Wandering through the gardens with rows of tents filled with antiques, collectibles, and loads of salvaged and upcycled furniture and household items, it was clear that everything old is absolutely new again. 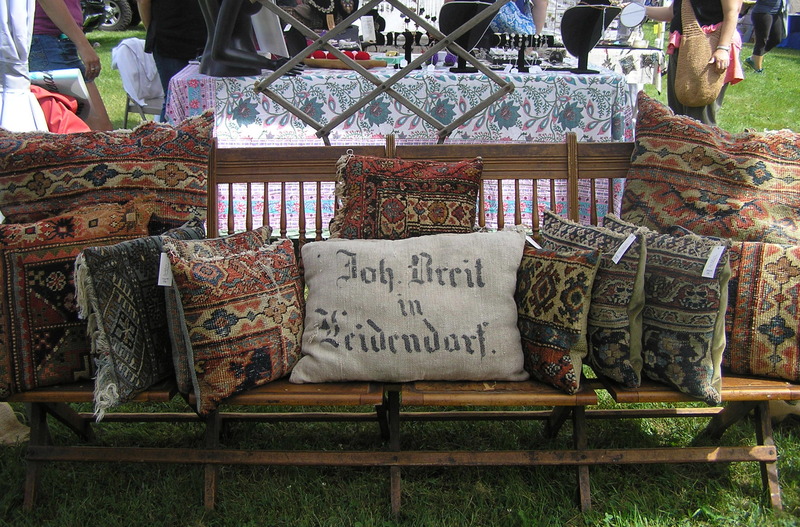 Jwrobel, where we discovered these pillows created from old, threadbare wool carpets. 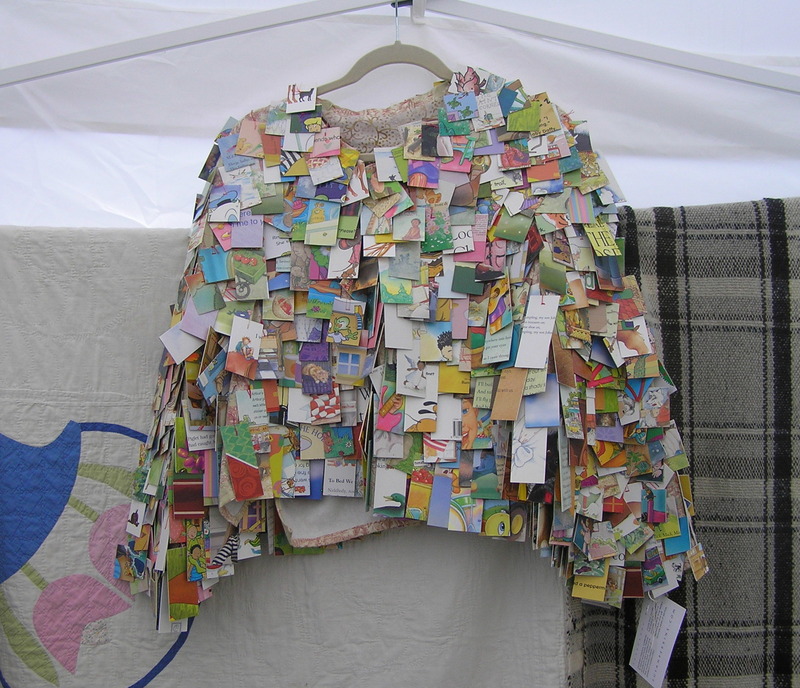 To that end, the artist “sources her materials to be organic, fair trade, recycled, vintage, and/or re-purposed”. Where most would have seen junk, Jess, the studio artisan, saw art and stitched these timeless pillows, the perfect complement to any country home decor. From Garden Guardians came these whimsical characters, born of concrete, created by Valerie McCaffrey of Ballard Street Studios in Portland Maine. 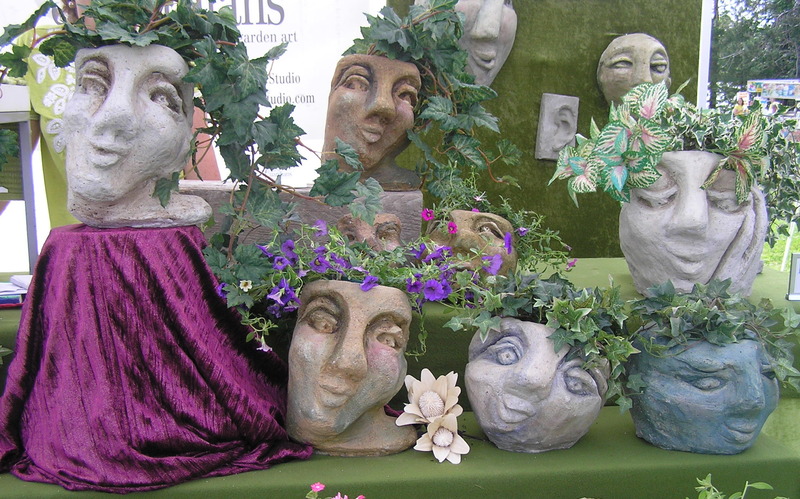 These mysterious stone faces are fashioned to add grace and charm to your natural landscape. 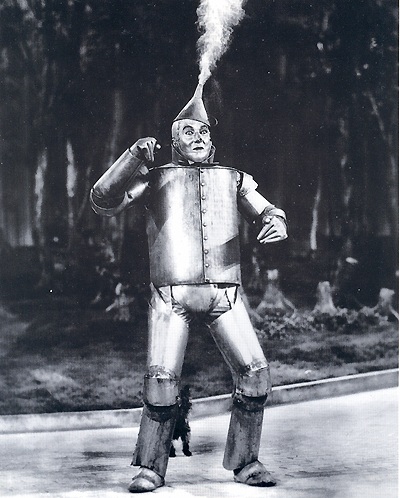 “If I Only Had a Heart” sang the Tin Man in the Wizard of Oz. He would have found his in this amazing shop, “Tin Hearts”, where metal artist Carol Mataruso creates these fanciful dolls from “anything and everything”. “Reborn, with lost objects and a new heart”. Extraordinary. 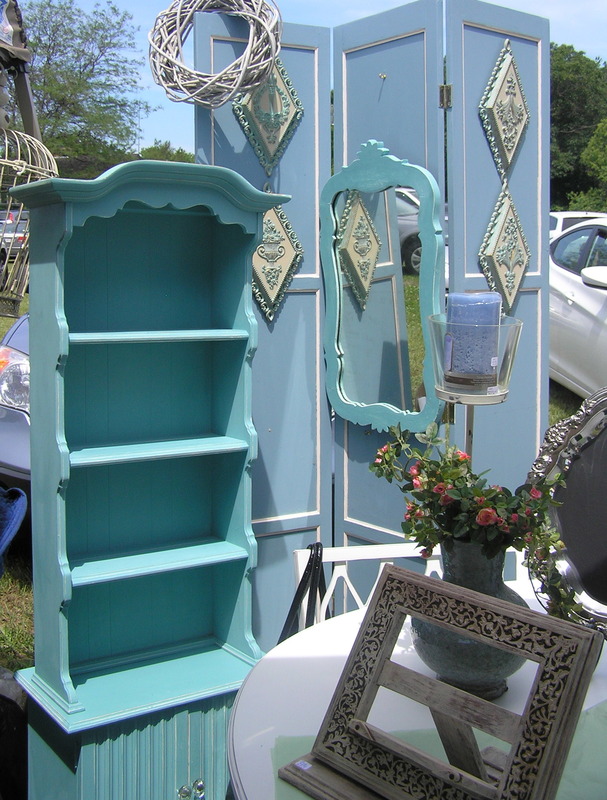 There were loads of booths with all sorts of salvaged, re-purposed, re-painted furniture. 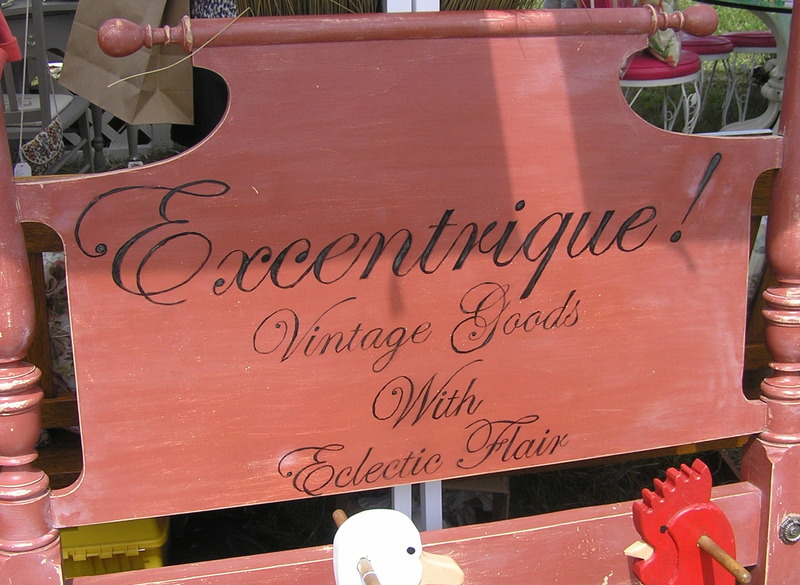 The best of the bunch, in my humble opinion, were at the “Vintage Chic Boutique”. 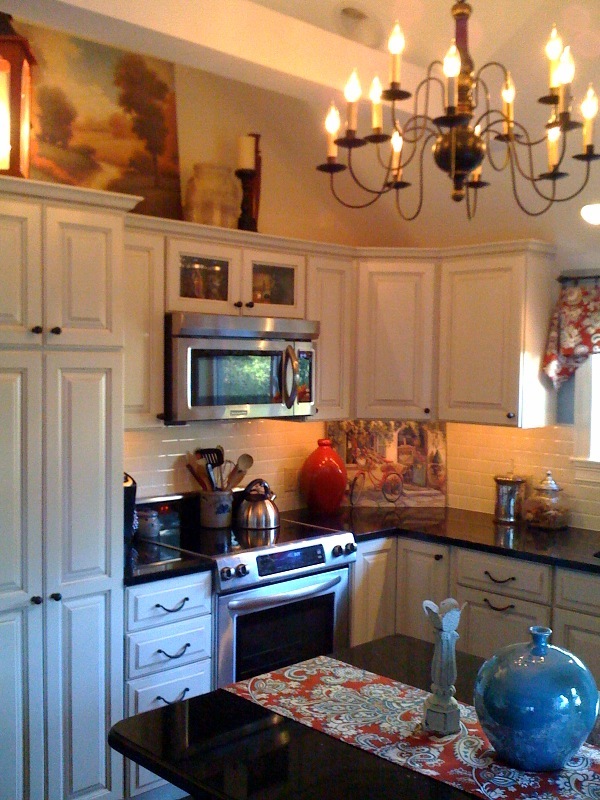 Painstakingly hand-painted, distressed and waxed by Kimberley Wilson and Sheila Bussone, using Annie Sloan Chalk Products, these recycled pieces were eye-catchingly colorful and sooo “country pretty”. 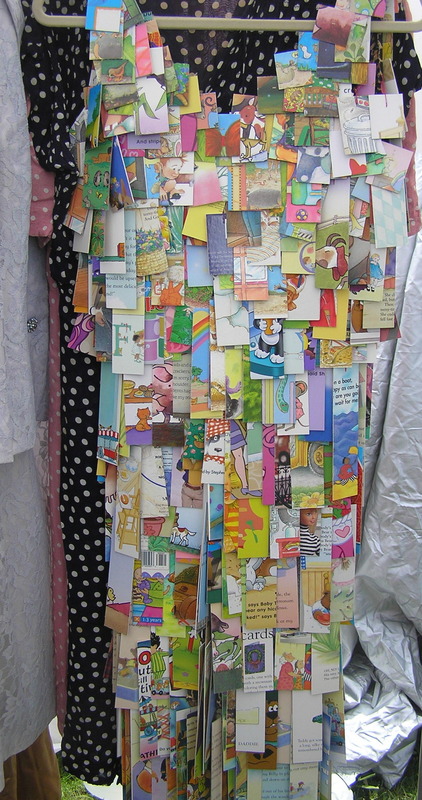 Reminiscent of a 30’s flapper dress, this “A Dress Book” was created by artisan Susan Perrine with “fringe” made from hundreds of pieces of childrens books stitched on to silk! I haven’t quite figured out the logistics of wearing this outfit and actually sitting down, but it sure would turn some heads-as it did mine while I was attempting to read the mini pages! These epic pieces of rusted iron sculpture would be at home guarding any fortress or castle. Larger than life, striking in appearance, handcrafted by Gordon Frost of Rusty Iron Art. And finally…be still my heart… This perfect little vintage turquoise VW Beetle, re-purposed and morphed into a bug with a rump, this inventive traveling design studio by Holly Gagne Interior Design caught my eye. 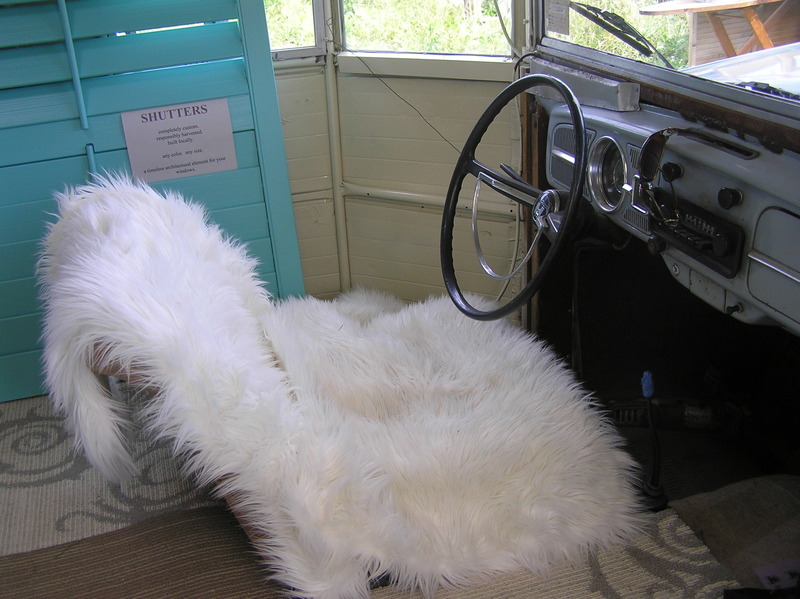 Stuffed with pillows that created a vintage vibe, with a sheepskin driver’s seat, and a little pop-up window to sell your wares. 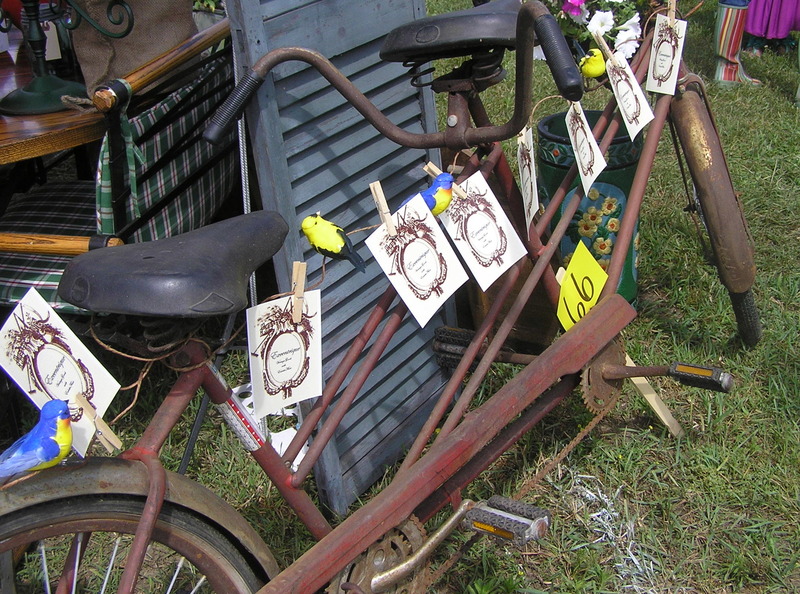 Recycling and re-purposing at its best….and so perfectly country cute!!! PS: Does anyone know where I can find an old VW Beetle, circa 1968?